Reconciling family life with work is one of the key issues of our time. Young parents need solutions which facilitate their professional commitment. Ambitious companies, for their part, would do well to support their key personnel in this important matter. 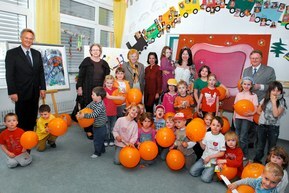 Another example of our social commitment is the establishment of creches in the vicinity of the company's premises. The crucial role played by the company, especially its Chairman Siegbert Lapp, enabled the umbrella association Kind e.V. to be founded in Baden Wurttemberg. The aim of the association is to improve the infrastructure for working parents and help them to cope with the demands of job and family. The Kind e.V. umbrella association support initiatives to establish children's homes.